As part of the upcoming Pocket Box project (follow us on Kickstarter for notification when the campaign launches on Wednesday! ), the factory has been preparing files by scanning the original games. A part of that process captured old advertising materials, including a couple of Steve Jackson Games catalogs from the '80s. 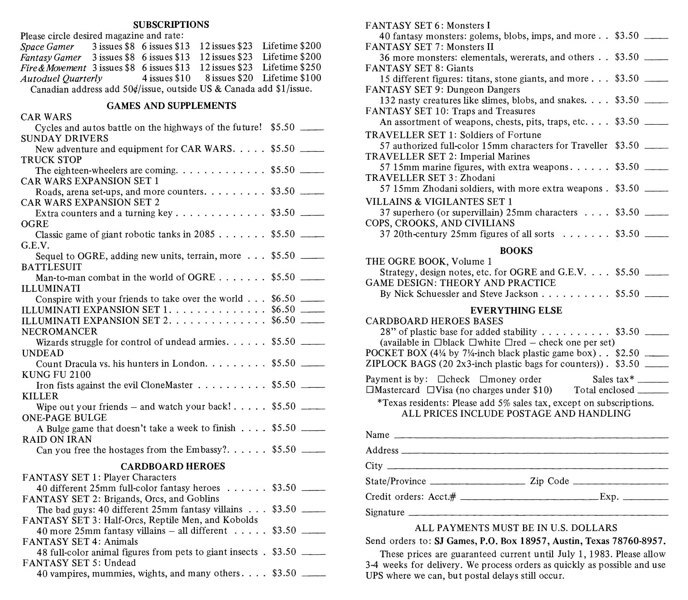 As a toy collector, one of my favorite things has to be old catalogs; seeing the original sales text and prices is always a treat, and that is as true for games as it is toys! This two-page spread from the Summer 1983 catalog shows exactly what these classics cost back when they were first published. Wow. This information will come in handy those times you want to start a conversation with "Back in my day . . ." At least, that's how I'm gonna use the prices listed in the catalog.